The Akihasan Hongū Akiha Shrine refers to two shrines: an upper shrine located near the summit of Mt. Akiha (elevation 866m), part of the Akaishi mountain range at the southernmost point of the Tenryū river in Hamamatsu City, and a lower shrine located at the southeastern base of Mt. Akiha. At the summit of the upper shrine, one can see the Tōkai region as well as all of Hamamatsu-city On a nice day the view extends far into the Pacific Ocean, making it a popular spot for sightseeing. It is said that the establishment of the Akihasan Hongū Akiha Shrine dates back 1300 years ago to the 2nd year of the Wadou Era (709CE). The shrine is associated with the god of protection against fires and is revered as the head Akiha shrine in all of Japan. People from all over the country come to pray for protection against fires or, for those who are involved with fire in their work like firefighting, cooking, and thermal power generation, come to pay their respects at this shrine. Furthermore, the origin of Tokyo's famed electronic district, Akihabara, is said to have come from the Akiha Shrine. During the Meiji Era where massive fires were frequent in Tokyo, the land in which the current Akihabara exists is where the Akiha Shrine was placed for the sake of guarding against fire (that particular Akiha Shrine has been moved to what is now Taitō-ku). By car one can reach the upper shrine at the summit from the lower shrine at the base in around 20 minutes. But you can also walk the ancient road approaching the shrine which has been used by worshippers since olden times. From the lower shrine to the upper shrine it takes about an hour and a half to two hours by foot. With an elevation difference of about 750m, this trail has become a popular hiking course. The large Japanese cedar among the mountains were originally natural but in the Bunmei era (1469~1487) they were afforested and cultivated. Just below the summit is the Shrine Gate, the sole remaining architectural structure built in the Edo Era in the prefecture. This splendid gate reminds one of the prosperity of the Edo Era. In front of the main shrine, the golden Torii of Happiness will catch the eye. It is a recent reconstruction of a Torii that symbolized happiness that was once erect upon Mt. Akiha. Wishing for the happiness of many people, this was reconstructed to imitate the golden Torii of Happiness of the past. Also, every year at Akiha Jinja, players from the popular hometown pro soccer team, Jubilo Iwata, come to pay their respects. There is a special plate within the grounds, praying for the team's victory, dedicated to this shrine. At the base of Mt. Akiha, amongst the dense forest the Lower Shrine quietly awaits. From the Lower Shrine of Akiha Shrine it takes 90~120 minutes by foot on the shrine road (The Tōkai Nature Trail) to reach the Upper Shrine. At the Akiha Shrine, there is a slightly unusual ritual called the "Tengu plate throw." The ritual consists of taking an unglazed clay plate, writing a wish on it, then aiming and throwing it at a target. The thrown plates will eventually become soil, so there is no worry. The targets are small and rather difficult to hit, but definitely worth a challenge. ★3 plates for the "Tengu plate throw," as well as a fortune reading and a lucky charm are 500 yen. Every year, on December 15th and 16th, is the "Akiha Fire Festival." 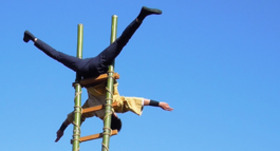 In "Himatsuri" (literally "fire festival"), three traditional dances are presented: the bow dance "yumi no mai", the sword dance "tsurugi no mai", and the fire dance "hi no mai". In the bow dance, arrows are shot skyward towards the east, west, south and north, in order to wish for a bountiful harvest. 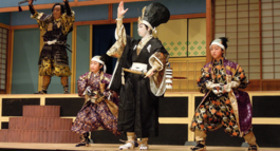 In the sword dance, two swords are used to purge sin and impurity. The fire dance uses a torch, lit from a sacred flame burning for thousands of years in the inner part of the shrine, to burn away natural disasters and other forms of sickness. It is said that the festival originated in the Nara period (710-794) from a sincere respect towards fire, and the style of the three dances has been used since the Kamakura period (1192-1333). Known for its majestic splendor, many visitors outside of the prefecture come to join the festivities.